Providing a short sleeve aerodynamic race suit at an entry level price, the Core Men's Short Sleave Race Suit utilises a mix of lightweight Aquastretch and highly breathable Vapour fabrics. 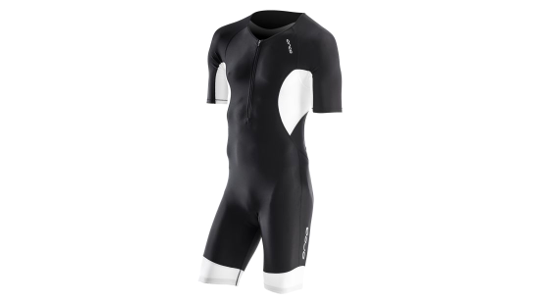 Strategically placed hidden pockets provide easy access to your nutrition and the 6mm Tri-Support Chamois gives greater comfort on the bike - making this suit ideal for triathlon. Providing greater aerodynamics on the bike as well as further sun protection coverage this short sleeve design gives a price-point option for those looking for a fast sleeved race suit. This light weight fabric dries fast and provides supreme breathability, while it's Orca Enduro Water repellent coating improves glide through the swim. Combined with a soft mesh back panel, these Vapour side panels provide extra breathability and comfort where you need it most.